I have an exciting project to share with you today. But you will have to pop over to the Simon Says Stamp Blog to see it all. I created a scrapbook page using the Simon Says Stamp December Card Kit. This kit is amazing. My favorite part of it is the stamp set, which I used on the tag shown in the picture below. In my blog post, I share how I used the 8x8 papers on my layout as well as the unique and fun embellishments included in the kit. 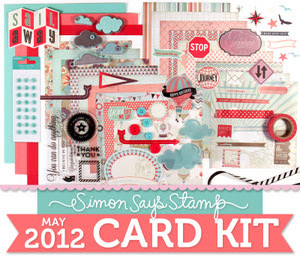 You are going to see how these card kits are not just for card makers anymore!! See you on the Simon Says Stamp blog! Do you want to see more? Sure you do! I've written a blog post for the Simon Says Stamp blog where I show you how I stamp on my scrapbook pages. I share a couple easy tips that will get you stamping in no time. Welcome to this week's Simon Says Stamp Challenge blog day!! This is always the best week of the month because it is always our Anything Goes Challenge. Easy peasy, right? Just create something this week, share it on your blog or online gallery and link it up to the Simon Says Stamp Challenge blog. I love seeing the Anything Goes Challenge entries because there are always so many beautiful, interesting and unique creations!! So this week, the design team is also spotlighting all kinds of twine, string, and hemp. Simon Says Stamp carries a ton of it and I scored big time when I found this Hemptique hemp cord. It matches perfectly with this paper pad from Simple Stories. Simple Stories has great 6x6 paper pads. Not only do you get all of the regular sheets of paper but you also get some of the special papers which you can cut apart and use on your card like I did here with the journaling spot. Here is a closeup picture of the hemp cord and some beautiful Prima flowers that matched very well to the paper too. Love the size of these flowers. They are great for cards. You can also see part of the stamp set that I used. It is a great mini stamp set from Unity by Jillibean. It has this great banner image and then three sentiment stamps that fit inside the banner image. The butterflies were cut using a Martha Stewart punch and the small white flower is from Maya Road. I also added a small strip of Bella Blvd Washi tape and some gems from Kaiser Craft. I can't wait to see your cards. Please make sure to link it up for a chance to win a $50 gift certificate to the Simon Says Stamp Store. I have listed all of the supplies that I used to make my card below. Just click on the link and it will take you straight to the store! Welcome to a new challenge from the Simon Says Stamp Challenge blog. Today we are challenging you to create a Father's Day card or Masculine card. The girls on the design team a fabulous job and I know you will too. I can't wait to see your cards! My card using supplies from the Echo Park Charming collection kit. In the kit you get double sided 12x12 papers, a 12x12 shape sticker sheet, and a 12x12 alphabet sticker sheet. There are also journaling cards on one of the papers and some lovely border strips. This is hands down my most favorite masculine collection that I have seen in a long time. Please join us this week for a chance at the $50 gift certificate that is given away each week to challenge participants. It's a fantastic prize and just think you could buy an awful lot of card making supplies with that gift card! Hope to see your card in our Linky line up! Wow, I love clean and simple cards but sometimes struggle with the process of creating one. I always think that maybe it needs more here, more there. Clean and simple is not always simple but using the right kind of stamps and paper sure helps. This week, on the Simon Says Challenge blog, we are challenging you to create a clean and simple card. Remember less is sometimes more. For my card, I used stamps from Lawn Fawn. Lawn Fawn's simple and bold illustrations are perfect for the clean and simple look. I stamped the airplane stamp on white cardstock and then colored it in with Copic Markers and cut it out. Look for it in the July issue! Paper choice is another thing to consider when creating a clean and simple card. The bold patterns of the Echo Parks Hello Summer papers are great for this look. Just to add a little interest to my card, I die cut some clouds out of felt from a die by Memory Box called Puffy Clouds and added a colored brad to my banner from the Hello Summer collection. The sentiment is part of the Lawn Fawn stamp set. You can find all of the supplies that I used in my card in the links below. Thanks for stopping by today and don't forget that all you need to do is make one card, post it to your blog or online photo gallery, and link it up to the challenge post here. 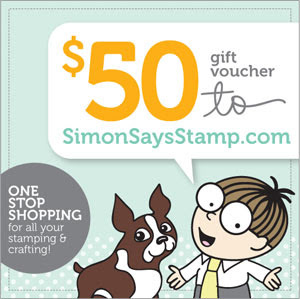 You could be that lucky participant that will win a $50 gift certificate to the Simon Says Stamp Online store. I hope to see your card in our line up! Here is my card for this week's Simon Says Stamp Challenge for this week. Think of something sweet. Not so hard for me because I love sweets. I tell everyone that if it were possible to live off of sweets, I would! So I created a card that used one of my favorite stamp sets from Paper Smooches which is filled with images of yummy sweet things. I thought the doily was a nice touch behind the images. It's just a paper doily that I bought from Wilton while looking for cupcake liners. This image shows the Gelatos that I used. I love the creamy texture of them. They are very soft. There are a lot of different ways to use them but on this card, I used them like watercolor crayons. I filled my Aqua Painter with a little bit of water and then dipped it onto the gelatos to pick up the color. Then I brushed it on my image. It was a lot of fun to color my stamped images this way and very quick. Thanks for stopping by and checking out my card for the Sweet Tooth challenge at Simon Says Stamp Challenge blog. Simon Says Stamp's Challenge Blog Celebrates their 3rd Birthday! This week we are celebrating our 3rd Birthday! This calls for a party and of course you all are invited! In honor to really celebrate we will be having extra prizes at Simon Says Stamp and a special sale for followers of this challenge only, be sure to check out below for details! When you go to check out, enter the promotion code at the bottom of the page that says "Billing & Shipping" at the top. There will be a box for you to enter your promotion code which will automatically deduct this amount from your total upon check out. Here is my card for this week's challenge and birthday celebration. I love this Congratulations Tilda stamp. You can use her for so many occasions. The sentiment is a Unity stamp co branded with Simple Stories. I love the outline shape of it. I used my Copic markers to color inside of it to match the card. In addition to the Magnolia stamps, I added some Magnolia flowers in two different styles, some May Arts ribbon, a Zva Creative gem flourish, Cosmo Cricket Baby Jane paper, and a Spellbinder's die for the image mat. I also used some Stardust Stickles on Tilda's dress and Glossy Accents on the bow, party hat and sentiment. I hope to see your creation for this week's challenge on our Linky list. Help us celebrate big!! We're so proud of our amazing team, please be sure to check out everyone's fantastic Birthday themed inspiration this week! Wow, the year is flying by already. I can't believe that the kids are starting to count down the days until the end of school already!! I think it was the lack of winter and cold weather around here that has gotten me all bloggled in the mind about the time of year it is. So today we have another great challenge at the Simon Says Stamp Challenge blog. It's the best time of the month because our theme is Anything Goes. That's right, we want to see any of your beautiful creations that you have made this week starting today. The design team has been issued an extra challenge and we would love for you to play along if you can. We all used stamps from Paper Smooches. If you haven't seen these stamps yet, you need to check them out. They are the cutest stamps and have such fun characters and sentiments. I have started my collection so you can be sure that you will be seeing them from me a lot more in the future. So here is my card. I used the stamp set called Healthy Vibes. I loved the sentiment! Another thing I love about Kim Hughes's stamp sets are the "fonts" she uses for her sentiments. Actually I am pretty sure it is her own handwriting. Wish I could write like that! Sooo cute!! My card is farily simple but that is why Paper Smooches are so great. You can make a very simple card with them that looks adorable. Here I used the stamps for paper piecing the cup and spoon. I popped the spoon up with foam dots and placed it all on multiple mats. The paper is from the new My Mind's Eye paper line, On the Bright Side. Join us this week for a chance at the $50 gift certificate that is given away each week to challenge participants. It's a fantastic prize and just think you could buy all of the supplies that I used to make my card and still have money left over for more!! Here are the supplies that I used to make my card. Click on the image to take you to them at the Simon Says Stamp store! Ready for another fabulous challenge from the Simon Says Stamp Challenge blog? I am, and so are the other designers. We have a sketch challenge this week and had a lot of fun. Here is the sketch created by Dawny! I used a stamp from Stamping Bella called LuLu's Pies. I love the LuLu stamps and plan on adding to my collection soon. I need to give some credit to a special someone for this card. It is not usual for me to CASE a card but while commenting on all of the wonderful cards that are linked to the Simon Says Stamp Challenge weekly, I came across this card and I just couldn't help myself. :) I think it is one of the cutest cards that I have ever seen. I pinned it on Pinterest right away, bought the stamp and waited for a chance to make one of my own. So thank you Steph at Honey Boutique. You totally inspired me with your card and talent! Click on the links below to find all the supplies that I used to make my card.